The awesome Yamaha GP1800R 2019 - enjoy REAL high-performance. 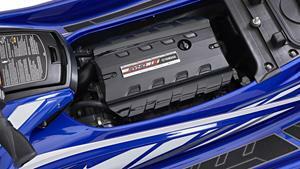 The awesome Yamaha GP1800R Waverunner – enjoy REAL high-performance. Over many years, Yamaha’s GP models forged an unbeatable reputation among serious racers the world over. This magnificent heritage is clearly visible and very much alive in the shape of our high-performance hero, the GP1800R. It’s the answer to every performance enthusiast’s prayer – an incredible-looking, super-smooth, super-powerful machine with a strong, agile hull and the ability to respond to the rider’s every command precisely, predictably – and in an instant. When such a machine includes the latest technical and electronic innovations – often unique and exclusive to yamaha – and proudly carries that famous name, you know you’re in the presence of a legend. Meet it. This amazing engine produces smooth, flexible power and features highly efficient cooling and air intake systems as well as strong engine internals. The 160mm Hyper-Flow jet pump helps turn that power into electrifying acceleration – and the Electronic Fuel Injection (EFI) gives ultra-smooth and efficient power output. Made possible by Yamaha’s unique materials technology, NanoXcel2® is an impressive 18% lighter even than our revolutionary original NanoXcel® – yet just as rigid and strong. 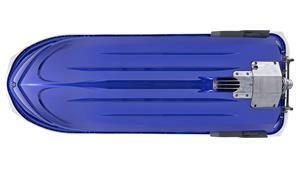 So it maximises the exciting sports performance hull design of the GP1800 to deliver sensational acceleration, higher top speed and greater economy. The revolutionary RiDE system transforms your riding pleasure, bringing a new feeling of confidence, especially for sports-style riding. Simply pull the throttle lever on the right hand-grip to move forward and accelerate – pull the lever on the left grip to slow down or reverse. Yes, it’s really that simple! 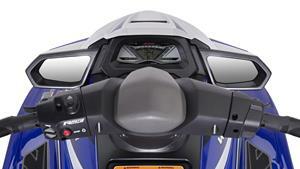 This innovative system is an industry-first for Yamaha. One click on the remote transmitter button engages a special “L” mode (Low RPM) to limit top speed – ideal for controlled manoeuvring. For your security and peace of mind, pushing a second button disables the ignition. The GP1800 is a really sporting machine, with Yamaha’s race-winning reputation around the world behind it, so it needs to look the part- and it does. With aggressive graphics and exciting metallic hull colours, a multi-tone textured seat and 2-tone Hydro-Turf mats, it’ll make you feel like going out to fly across some water! When you’re out there enjoying yourself, it’s good to know you’ve got your personal gear stored safely away. So the GP1800 has generous stowage space, including a glove box with a bottle holder, a watertight compartment under the single seat – and there’s a very handy bow storage space too. We know you like to tow things and people from time to time and the GP1800 makes it a real pleasure. We’ve fitted a strong towing eye, a pair of large integral rear-view mirrors, very comfortable Hydro-Turf mats and a soft-touch re-boarding step.